Atlantic Salmon Flies: Urban Fishing...why not? Fishing for Atlantic salmon in Shonguy, Russia. 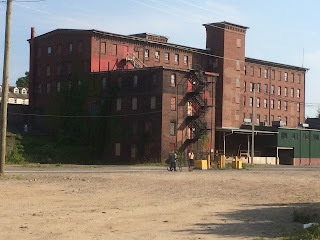 Some buildings look like they are straight out of a WWII movie. I've been fortunate enough to fish some truly spectacular places. The Colorado River, in Lee's Ferry, Arizona, is deep within Glen Canyon, the entrance to the Grand Canyon. The scenery was spectacular enough for me to miss a few wild rainbow trout, being totally memorized by the height, color and textures of the canyon walls. Staring into the crystal clear water of Quebec's Bonaventure River can be just as hypnotic. The beautiful blue Pacific off the coast of Hawaii's Big Island is truly a sight to behold. If I had to pick one place to spend the rest of my life, it would probably on one of the Hawaiian Islands. It can be just as easy to get wrapped up in the beauty of my local water. What's prettier than the Housatonic River in autumn? My hometown shores of Narragansett, Rhode Island are beautiful and have enormous sentimental value to me. When a bald eagle flies over the Farmington River, I always stop what I'm doing to watch it glide by. Many of us fish to be in places like the ones mentioned above. It's a great escape from a hectic office or life in a frantic city. The air is clean, the colors are vivid and they are places where we can clear our heads and appreciate the beauty of our surroundings. Having said all of that, I'm not one to let the grit of what has come to be called "urban fishing" bother me one bit. In fact, I spend more time than ever fishing in urban environments. It's remarkable how good urban fishing can be. 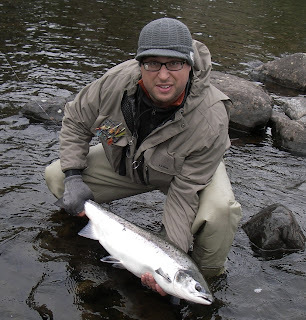 In fact, some of my most memorable fishing experiences have been in cities. For anglers willing to swap beautiful meadows and beaches for rundown industrial parks and highway overpasses, there is some excellent fishing to be had in cities across the globe. Like a lot of fly fisherman, I was initially put off by the noise commonly found in urban fisheries. The traffic sound is probably the biggest aural distraction, followed by the occasional sounds of sirens. One of my best days of fishing anywhere was on the Dutch side of the island of St. Maarten. I fished behind a police station, which happened to be next to a busy traffic circle. The ever present sound of roaring engines, police and ambulance sirens, and car horns was enough to drive a fly fisherman mad. Hitting concrete walls with my backcast didn't help, either. Despite the less than idilic setting, the place was loaded with small tarpon who were on the feed. It was pretty easy to block out the noise when 10-25 lb. baby tarpon were busy inhaling topwater flies. Some places have a "unique" scent, which can be even more off-putting than the sounds. The Naugatuck River has a slight aroma. It bothered me a little at first. I have since learned to ignore it. I've fished there so much, I'm not sure I can detect it anymore. It's not bad in most places. There is one area, however, that I won't fish due to its proximity to a sewage treatment plant. The smell is just too much for me. It's a shame. There are some nice pools there although, as tolerant as I am, I just can't stomach it for any length of time. 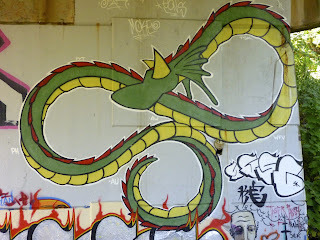 This dragon reminds me of old Powell & Peralta skateboard graphics. I have to say, I actually like some of the graffiti. Then there are the eyesores. My newly found shad fishing spot fits into this category. There is trash almost everywhere. 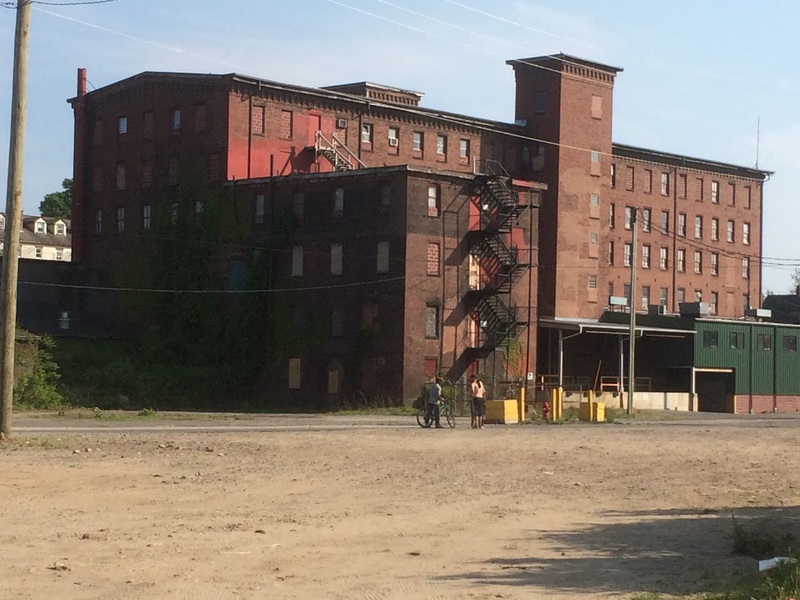 There are tires in the water, liquor bottles all over the banks, graffiti on most flat surfaces, and abandoned factory buildings all around. I only started fishing there this year but, since I have been conditioned by other urban fisheries, the setting rarely bothered me. When the fishing was red hot, as it was on a few occasions, all I saw was the water, the fish, and my line flying out of my reel. Finally, there are the people. In some cases, there are lots of people, many of whom offer unsolicited fishing tips any chance they get. Most wouldn't know which end of a hook to tie on their line. However, for every five or so delusional "experts," there is someone who will offer really helpful advice. The best tips usually come from conventional fishermen, not other fly anglers. The delicate sensibilities of the fly angler usually keeps him or her away from such locations, but spin fishers are no strangers here. Many are totally keyed into what's going on in their urban fishery. 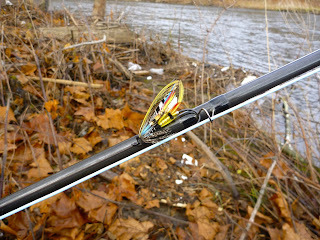 Every season on the Naugatuck, the information I find most reliable comes from a small group of spin fishing friends who know the river inside and out. Then there are the impoverished. Sometimes I find it difficult to enjoy my leisure time when I'm looking right at a homeless person who is sick and living under a bridge. It's an image that can be difficult to witness, especially in cold weather. If I know I might come across someone who has fallen on rough times, I pack an extra sandwich in case I bump into him or her. So they are the people you might want to talk to. How about the ones you'd rather avoid? Some are more irritating than others. 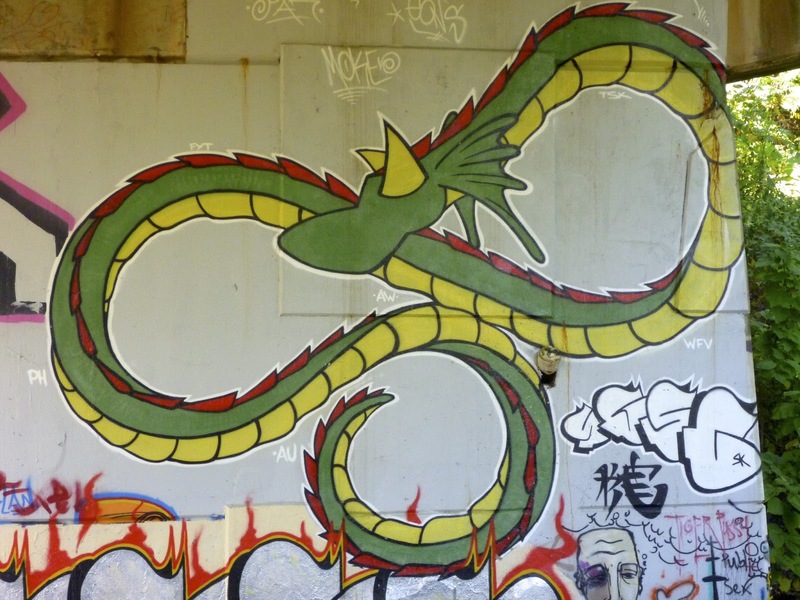 The graffiti artists vandalize public and private property, but some of their artwork is pretty cool. The dog walkers can be a real problem, especially if they let their dog swim into the pool while people are fishing. Drug addicts and dealers are an unwelcome part of urban fishing, but most keep a low profile and are rarely a problem. As far as directly affecting the quality of fishing goes, the worst culprits are the rule breakers and poachers. Never have I witnessed such overt displays of poaching as I did when fishing northern Russia's Kola River. When a pair of camo-clad poachers stretch a net right below your pool, you might as well pack up and move, because not much is getting through. The worst part was seeing that activity go unpunished in the less regulated sectors of the river. It happens at home, too. Maybe not as frequently or on such a grand scale, enough to be a real downer. Spectators can be another annoying byproduct of urban fishing. Did you just land a really big fish right next to a park's walking path? 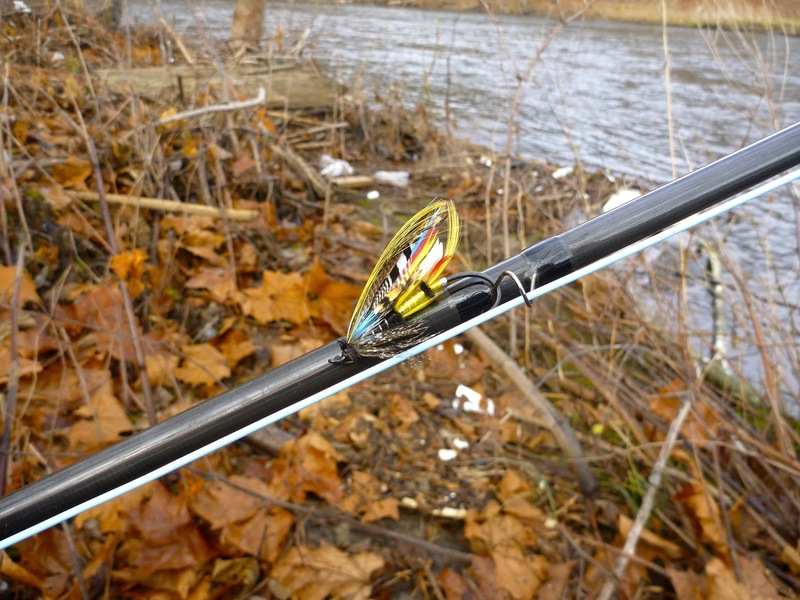 Have you ever caught fish after fish within view of passersby? Having a great day of urban fishing can be a longterm kiss of death if people see you and call their friends. It happened to me earlier this season. Other than giving up when the fishing is good, which is silly, I'm not sure how to prevent being watched. Despite the drawbacks, I've had enough positive urban fishing experiences to keep me going. Unless it's downright dangerous, I'd never turn down a chance to experience good fishing just because it wasn't in a wilderness, or even suburban, setting. I spend virtually all spring and fall fishing in urban settings. I have made memories and new friends while urban fishing. I have taken some interesting pictures that really tell a story. Best of all, I have caught some serious fish right in the middle of the city. All this and very few mosquito bites to show for it! water treatment plant and train tracks. Nice post Ben. There's a certain charm in "connecting with nature" where it isn't supposed to be possible to do so.